Pasadena Tree service was started in the late 1960' by Desmond Allred and ran together with Ashley Allred. They are a professional tree cutting company owner, with a degree in landscaping & Horticulture. Desmond and Ashley has a wealth of knowledge and experience in bringing out the best in tree care needs. Desmond has also studied urban tree growth and fertilization to maintaining long life. So you can count on the Allred's expert experience with tree cutting for all your tree service needs and situations. Pasadena Tree service currently employs many tree cutting professionals, so no job is too big or too small. We have a wide range of professional equipment, including crane access for tree removal if needed. Our tree cutters are drug free and we hire only top of the line tree service men to work for Pasadena Tree Service, giving you and your lawn the respect it deserves. Maintaining a proper tree service with straight employee's is tough, but worth the effort to satisfy our customers. We are proud to be part of Pasadena Texas, and look forward to any job we may do for you, or the time we can help you with your tree service questions. Tree removal and tree trimming has been in our family for 3 generations. Pasadena Tree Service is licensed and insured in every state. Holding bonds and 1,000,000. coverage. We specialize in tree removal, tree trimming, tree pruning, stump grinding, all aspects of your tree care needs. Whether you are a large pasadena owner, commercial property owner or have a tree in your residential yard, we can be of service to you with low prices. Healthy, beautiful and safe trees enhance the quality of the environment and outlook of your home or business. Our Pasadena tree service works throughout Pasadena and surrounding areas of Houston, Texas. Pasadena tree removal and trimming service crews have built an enviable reputation for skilled detailed attention to all aspects of tree care, conservation and cultivation. Being the tree climber is one of the most dangerous jobs in the world. Climbing up a tree with spurs, ropes, or being pulled up with equipment is the way to go up a tree. Then he must make proper cuts on the tree to ensure the safety of him and the ground guys below, also to make sure not to cause any damage to the property or material surroundings. He must have the knowledge of what type of tree he is cutting or trimming to make sure the life of the tree is maintained or how the tree comes down. He must be well experienced to keep the ground workers busy to make a daily profit. Tree removal is the most dangerous thing he can do. Pasadena Tree Service, a professional company in Pasadena Texas. We Have been cutting trees in Pasadena for ​residents and commercial properties since the 60's. We provide tree removal service, tree trimming service, tree shaping service, tree pruning service, lot clearing service, and all around tree care needs. Our tree service in Pasadena Texas, can complete any tree service need you may have or questions you inquire. There are many fields in a professional tree service company. For instance, a climber, ground workers, foreman, and salesman. The muscle of the company comes from the ground crew. The tree services ground crew takes care of most of the cutting, back yard debris removal or just plain log carrier. A tree service cutter must be experianced with a chainsaw and able to cut any form of tree on the ground or house to complete the job safe and efficent. He must be able to work all day in the heat of the sun or ice of the winter. They are one of the toughest men on the job site. After performing a tree removal service you will be happy to know securely with out damage to your property. ​He is the leader of the tree climbers and ground crew. He is responsible for the job getting done and maintaining the moral of the crew. The foreman deals with the customer and the over all completion of the job. Working less with his hands but more with his brain, organizing, and looking after the safety of the crew and climbers. The tree foreman is usually the most experience person on the job. He can make on job decisions and walk away or add to the tree job. 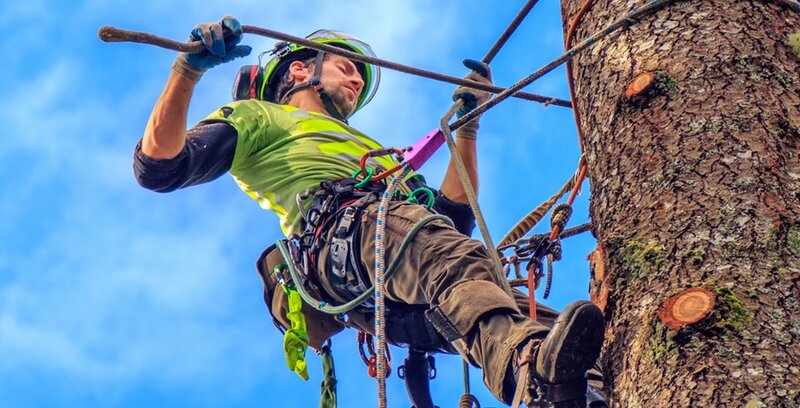 All aspects of the crew, climber and foreman are well equipped for tree removal, tree trimming, and every tree service our customers may have. Our network of professionals meet the demands of all health & safety requirements at all times. Like most other tree companies , they offer tree management services at regular standards and average prices. Poor quality tree cutting can kill valuable trees, cause hazardous conditions and significantly reduce the value of your home or commercial property. Pasadena Tree Service offers great prices to save you money, and also doing the job right. For more than 40 years, Pasadena Tree Service has been helping customers with their tree service needs. Three generation plus have built Pasadena Tree Service into a company we can be proud of, and a company you can count on. For ​more then 4 decades our tree removal services and certified tree trimming crews in Pasadena, Texas has been the most affordable arborist company to hire! We help our clients with their dangerous tree cutting and professional tree care services during summer, spring, fall and winter 24-7. Our educated arborist family has built the tree service into a company we can be proud of and a tree service you can expect to be on/time and affordable.